Gator Paper offers white as well as brown paper bags with handles in a variety of popular sizes. Add your logo to our paper bags with handles and market your business everywhere. These personalized shopping bags are both durable and eye-catching. These high-quality custom shopping bags are ideal for post printing, hot stamping, or using just as they are. With a five case minimum shopping bag order requirement you can’t go wrong! Help your customers get a handle on their shopper bag packaging needs with our line of custom printed Handle Shopping Bags! Perfect for restaurant take home orders or retail shops! Make a bold branding impression with our high quality, custom printed Handle Shopping Bags! How many Handle Shopping Bags are in a case? These paper bags with handles come 1,000 bags per case and have a 5 case minimum order requirement. With order requirements this small, you can’t afford not to give this branded bag a try. How long do custom printed Handled Shopper Bag orders take? Lead time for custom printed Handled Shopper Bag orders is 4-5 weeks. Three color spot PMS printing with full coverage printing capabilities is available. Adobe Illustrator, .EPS and high resolution PDF files work the best.. Vector art files are preferred. If the line artwork is simple enough, sometimes a JPEG file will work. Bitmap files are never accepted. 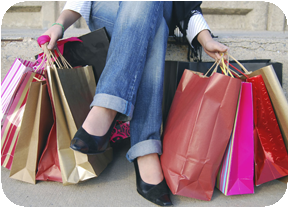 Need a price quote on Custom Printed Handle Shopping Bags? Contact us today!  Need to keep your hot sandwich hot for an extended period of time? 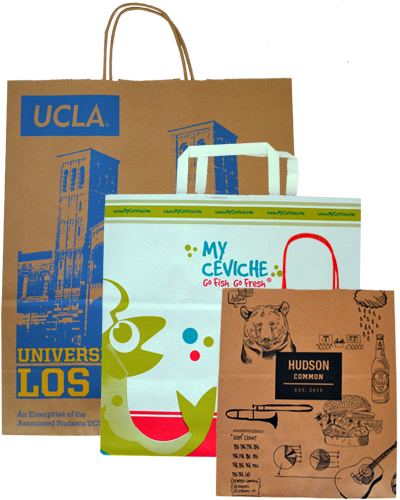 Check out our line of custom printed Hot Paper Bags! custom printed Hot Dog Bags! These industry exclusive bags are sure to exceed your expectations.